"It's natural for a sumo wrestler to become the world's strongest." Edmund Honda has been trained by the greatest sumo wrestling coaches since birth. Earning the title of Yokozuno ("Grand Champion"), Honda became legendary in Japan. Because of his great skill, he naturally attracted a lot of challengers. One such opponent was an American named Sodom. Sodom was looking to recruit sumos into his new Mad Gear Gang, but was no sumo himself and quickly lost. Honda was shocked to learn from Sodom that the outside world did not consider sumo wrestling to be a true sport. Sodom then suggested that Honda enter the World Warriors tournament in order to prove his skill. Honda prepared for his journey by undergoing an intense training regimin. When he was ready, he then set out to challenge other fighters to prepare for the upcoming tournament. Feeling that he needed to improve on his image, he donned kabuki makeup that would grab the attention of onlookers. Besides sumo, the kabuki stage had been Honda's other love, and he combined the two as he set out to challenge the world's greatest fighters. His travels led him to India, where he fought a skilled Yoga master named Dhalsim. Honda defeated Dhalsim, although it seemed that the Indian was distracted. Honda advised Dhalsim to join the World Warriors tournament, and started to leave when he encountered another Japanese fighter named Ryu. The two became friends, and they practiced together for a short time before journeying to Thailand to enter the second World Warriors tournament. 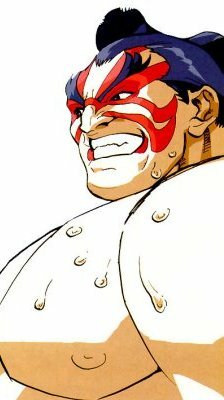 Honda won many battles in the tournament before he was finally defeated by Chun-Li. He fell in love with the beautiful warrior and began avidly pursuing her, but she showed no interest. Nonetheless, Honda remained until the end of the tournament to see Ryu defeat the host of the tournament M.Bison. After congratulating his friend, Honda returned to Japan confident that he had proved sumo's greatness to the world. He continued to train and began teaching students the way of sumo.